Airbrush makeup is replacing traditional makeup application. Traditional makeup artists are embracing the new concept to keep pace with technology and competition. There is a host of difference between the two. Airbrush makeup is done using a makeup air compressor, special airbrush foundation and airbrush gun. The foundation can either be water based or silicone based. Since it has to pass through a hose, the liquids have to be thinner than regular foundations. The spray is a fine mist and offers an even and consistent application on the skin. The makeup delivers a flawless coverage and is best for an evening out. It covers skin imperfections and allows your skin to breath. The result is a glossy and natural look. Depending on the skill of the artist the makeup, tools and products, the application can be taken to a whole new level. This all new revolutionary technique help acquire excellent control and precision while applying makeup. For natural looking and velvety skin, the airbrush technique is apt. What sponges and brushes are unable to give, airbrush can deliver long lasting and natural looking beauty. Recommended for active individuals and brides, the makeup is suitable for film and television artists. This makeup works perfectly for high-definition television making you camera ready anytime. All this has made this application technique famous. Any makeup artist with an edge to perfection and striving to expand their business. 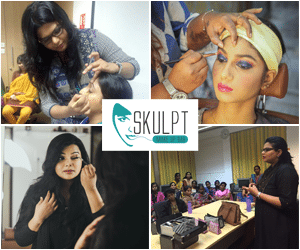 Skulpt has mastered the art of airbrush makeup and offers a three-day course in this technique. The makeup is all about creating a waterproof, smudge proof second layer of skin. Hide all imperfections and glow with airbrush makeup. What more? There is no need for any touch-ups. The makeup comes in varied mediums of water base, alcohol base and silicon base. Among this, silicone is ideal for bridal makeup to cover skin pores without clogging as it gives a dry finish. Enroll today and get ready to be noticed in the world of beauty!